In the coming weeks, the Foundation is rolling out several new resources on Solutions Finance: a series of white papers and related case studies, illustrating some of what we’ve learned over the last decade from our successes—and failures—in deploying capital for systems change. The first white paper is available today. We hope these resources will be useful to a growing community interested in financial innovation for positive social and environmental impact. Until recently, we did not talk about Solutions Finance. The new term requires a bit of unpacking. Social Finance refers to financial instruments that generate social and environmental impact alongside financial returns. It is a term widely recognized in the field and the umbrella term we have been using to describe the Foundation’s market-building and impact investing activities. However, as our experience and practice expand, we see that the promise of this work goes beyond investments with blended returns. Successful systems innovation requires adequate resourcing, and calls for different forms of capital allocation across the multiple stages of design and implementation. To make this happen in the context of our work, we’re advocating for — and adopting as our own practice — an integrated approach to deploying financial capital and adapting financial models to catalyze, sustain and scale systems transformation. In other words, Solutions Finance. This approach includes, but is more than, continuing to grow an investment portfolio with the expectation of a financial return as well as a positive social or environmental impact. At one level, Solutions Finance is about attracting private capital to the community sector and helping social enterprises to increase their positive social and environmental impact. At another, it is about capital markets evolving to include stronger standards of sustainability and demonstrating greater concern for societal impacts—responsible investing. It is also about enabling new forms of investor partnerships between allies, like foundations and development banks, or foundations and government, and working to change policy to stimulate financial innovation. For the Foundation, it is also about integrating our financial strategies, grants and investments and leveraging them to have greater impact in priority domains. Solutions Finance also recognizes the roles different types of capital play in the process of changing systems. This includes the whole spectrum from grants, impact investments and even investments that are not intentionally impact-focused. 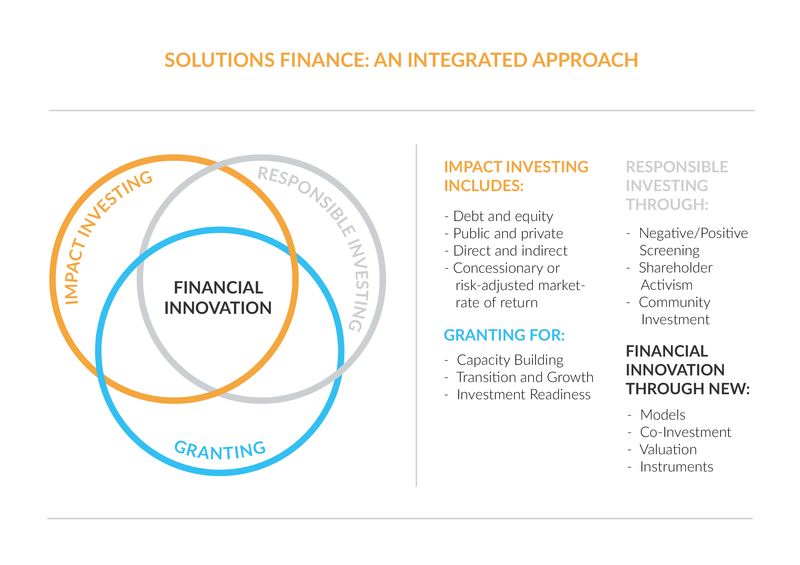 Solutions Finance is also about investing in financial innovation, and identifying or adapting financial models to involve stakeholders who would otherwise remain at the margins or work in isolation. It often involves new forms of collaboration, e.g. between governments, commercial investors and philanthropy, and leveraging resources for larger systemic impact, while ensuring community ownership and empowerment of different stakeholders along the way. Sixty percent of homes on reserves in Canada need repairs, and over the next ten years there’s a projected housing deficit of 80,000 units. Since land on reserves is owned by the Crown, and cannot be used as security for a loan, conventional banks and credit unions are reluctant to get involved. 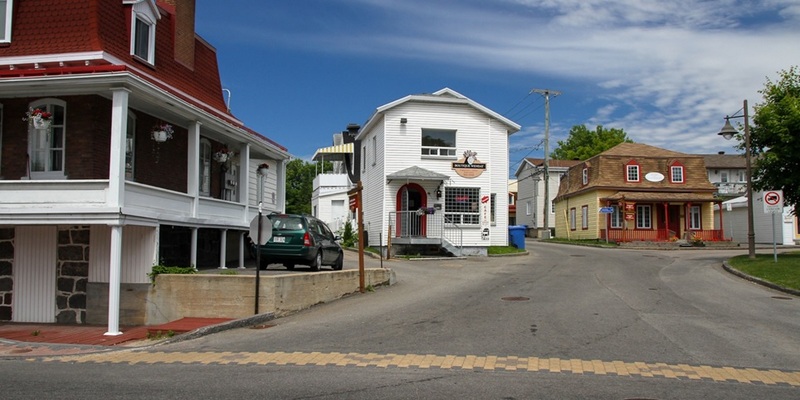 However, in the Huron community of Wendake near Quebec City, a new model emerged. A revolving loan fund operated by ABSCAN makes it possible for residents to build and own their own houses, and to rent, buy or sell them. There have been over 400 participants in this program in the last 10 years, and the annual loss rate has never exceeded 2%. There are good jobs available for carpenters, plumbers and electricians, and the community has established a school to train young men and women to fill them. McConnell is currently involved in a partnership with ABSCAN and the federal ministry of Indigenous and Northern Affairs Canada (INAC) to disseminate the Wendake model to four communities across Quebec. During the pilot expansion phase, the capital provided by government and the Foundation consisted of a grant for community readiness as well as an investment into a fund to make loans for housing. The investment was structured in such a way that it enabled ABSCAN to secure a larger sum of capital with a commercial financial institution. Having established a track record and market readiness, we hope that scaling out this model and building the 80,000 units needed across Canada can happen through increasing the number of actors involved—from government, to other impact investors, and representatives and of mainstream capital markets. In this first white paper, “Beyond Impact Investing, Towards Solutions Finance” you can learn more about our evolving practice. We welcome your questions or comments. We think Solutions Finance holds promise for addressing deeply entrenched social and environmental problems, and hope through this series to provoke lively conversations and useful learning here and abroad.